Chances are in the past few days you have probably heard something about snow and/or terrible weather for Halloween. I’ve mentioned the possibility of snow, with the caution of 1) the forecasts being far in advance 2) it being early in the season and 3) a rather complex scenario. As always, there is a lot of information floating around about this weekend. Some of the information is good, some of it isn’t. So let’s cut through the hype and break this down. The weather for Halloween this year isn’t going to be the best we have seen, even in just the last few years. However, it will be far from the worst, either. Over the next 48 hours, a storm system will track across southern Canada before diving south through the Great Lakes, taking up a position over West Virginia by Friday evening. As this system does so, it will spread some showers into the Finger Lakes on Friday. 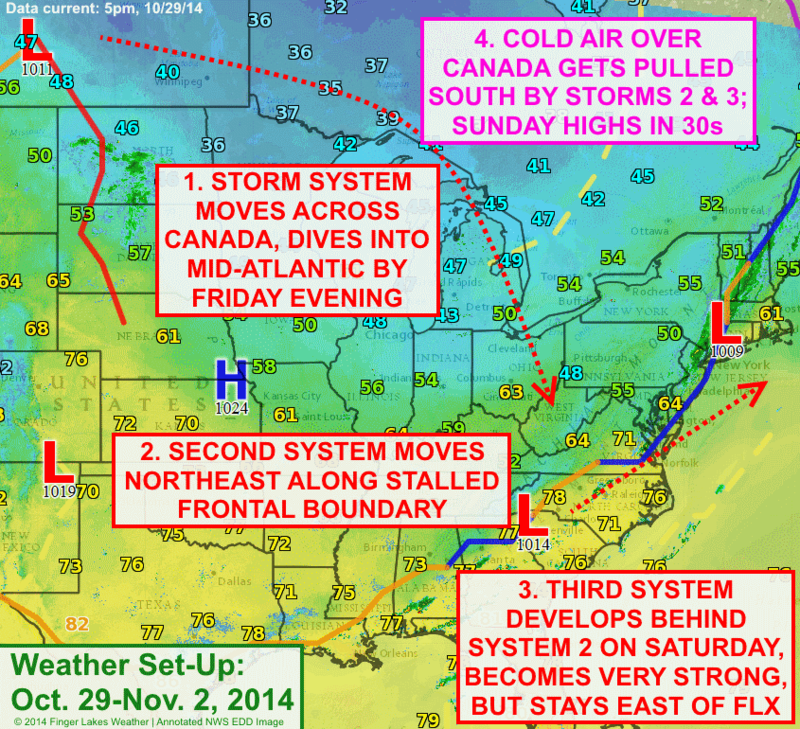 A complex weather pattern will create some active weather this weekend, but most of it will miss the Finger Lakes. Click image to enlarge. I do not think it will rain all day and all night Friday. Nor should the rain be heavy. There will definitely be some light rain in the area, but Halloween will not be a wash out. Temperatures will be cool- mostly in the 40s both during the day (upper 40s) and evening (lower 40s), but it will not snow Friday. The big story on Saturday will be the arrival of some rather cold air. This cold air will get sucked down over us from Canada as a powerful storm system explodes off the east coast. Temperatures will likely be warmer in the morning with more 40s continuing from Friday night, but by the afternoon, many places may only be in the 30s. This system will be well to our east though, so substantial precipitation (snow) is not a concern. Again, a few showers/flurries may be around, but conditions are not even looking overly favorable for lake effect. 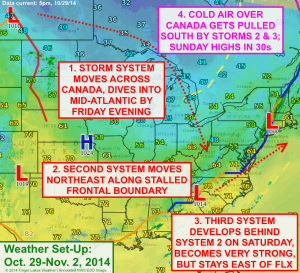 By Sunday, the core of the cold will move overhead. Many places will have highs in the mid and upper 30s. Like Saturday though, conditions will be unfavorable for lake effect and the nor’easter will be even further away. At most, a dusting of snow may stick around for a while after one of the flurries early in the day, but this is mostly a non-event for the Finger Lakes.